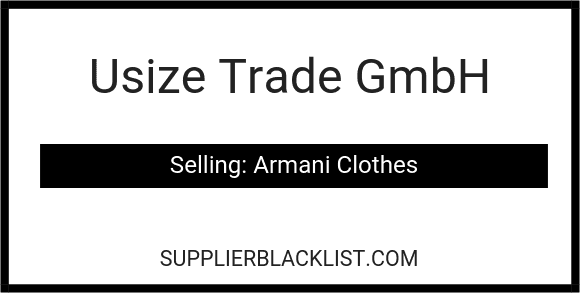 Have you been doing research on Usize Trade GmbH located in Germany sells Armani Clothes? If so, read on below to read one buyers experience when trying to buy Armani Clothes. from Italy and all original. After 3 months we get the suits delivered to Den Haag. We inspect the goods and found out, that all clothes are copy from China!!!! We still not get any response and I try to visit him but nobody was at their location. I lost 26598€ on this scammer! If someone else has been scammed, so please post that. Buying good only from stock !!! Need More Info on Usize Trade GmbH? If you need more information, you can click the below links to search for more submissions about Usize Trade GmbH on Supplier Blacklist as well as go to the search results page on Google for more reviews online about this company. Perform a Supplier Blacklist search for more reviews on Usize Trade GmbH. Search Google for Usize Trade GmbH Reviews.